As our cadets prepare for the approaching Remembrance Day Parade to the Windsor Cenotaph on Sunday, November 11th, the Cadet Band has been focusing on the challenges of playing while marching in the cold November wind which not only makes their music flap but it also rushes up their kilts. Hopefully, I will be able to capture a recording of their performance on Sunday, to be featured next week. In the meantime, I want to share this recording of the KCS Cadet Band that I seem to remember was recorded in 1975; that was the same year that I bought a car (an Austin Marina Deluxe) from KCS Commanding Officer - Major R.H. Finnie, CD. In those days, despite not being a student here, I spent a lot of time on this campus because many of my friends were studying here. Major Finnie took his role seriously and, being British and bold, had all of the boys properly ordered and a bit fearful. Quite a few of my buddies were in the marching band, and given that they only played once per week, they would frequently ask me to help them prepare their chops for Major Finnie, in hopes that they would be 'up-to snuff'. Here is an on-site field recording taken by Studio 2 mobile. The word of command is given by Major Finnie, then you hear the Drum & Bugle Corps respond with urgency and intensity, the trademark tune "KCS". The two glockenspiel players then got the chance to add "I'se the Bye" to round things out; good stuff! Although we're a brass & wind band now-a-days, "KCS" is still part of our repertoire. Many of our School activities are elective, but some offer such important benefits that every student is involved. Every KES Student participates in this long-standing, uniquely Canadian tradition. 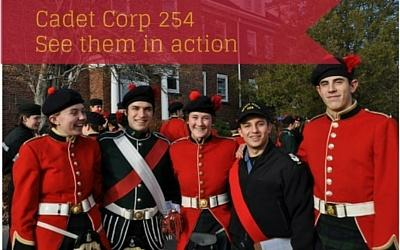 Download the Cadet Corps PhotoJournal for pictures and more.